Rosmarinus officinalis, commonly known as rosemary, is a woody, perennial herb with fragrant, evergreen, needle-like leaves and white, pink, purple, or blue flowers, native to the Mediterranean region. It is a member of the mint family Lamiaceae, which includes many other herbs. The name "rosemary" derives from the Latin for "dew" (ros) and "sea" (marinus), or "dew of the sea". The plant is also sometimes called anthos, from the ancient Greek word ἄνθος, meaning "flower". Rosemary has a fibrous root system. Rosmarinus officinalis is one of 2–4 species in the genus Rosmarinus. The other species most often recognized is the closely related, Rosmarinus eriocalyx, of the Maghreb of Africa and Iberia. The name of ros marinus is the plant's ancient name in classical Latin. Elizabeth Kent noted in her Flora Domestica (1823), "The botanical name of this plant is compounded of two Latin words, signifying Sea-dew; and indeed Rosemary thrives best by the sea." The name of the genus was applied by the 18th-century naturalist and founding taxonomist Carl Linnaeus. Rosemary is an aromatic evergreen shrub with leaves similar to hemlock needles. It is native to the Mediterranean and Asia, but is reasonably hardy in cool climates. It can withstand droughts, surviving a severe lack of water for lengthy periods. Forms range from upright to trailing; the upright forms can reach 1.5 m (5 ft) tall, rarely 2 m (6 ft 7 in). The leaves are evergreen, 2–4 cm (0.8–1.6 in) long and 2–5 mm broad, green above, and white below, with dense, short, woolly hair. The plant flowers in spring and summer in temperate climates, but the plants can be in constant bloom in warm climates; flowers are white, pink, purple or deep blue. Rosemary also has a tendency to flower outside its normal flowering season; it has been known to flower as late as early December, and as early as mid-February (in the northern hemisphere). In some parts of the world, it is considered an invasive species. Upon cultivation, the leaves, twigs, and flowering apices are extracted for use. Rosemary is used as a decorative plant in gardens where it may have pest control effects. The leaves are used to flavor various foods, such as stuffing and roast meats. Since it is attractive and drought-tolerant, rosemary is used as an ornamental plant in gardens and for xeriscape landscaping, especially in regions of Mediterranean climate. It is considered easy to grow and pest-resistant. Rosemary can grow quite large and retain attractiveness for many years, can be pruned into formal shapes and low hedges, and has been used for topiary. It is easily grown in pots. The groundcover cultivars spread widely, with a dense and durable texture. Rosemary grows on loam soil with good drainage in an open, sunny position. It will not withstand waterlogging and some varieties are susceptible to frost. It grows best in neutral to alkaline conditions (pH 7–7.8) with average fertility. It can be propagated from an existing plant by clipping a shoot (from a soft new growth) 10–15 cm (4–6 in) long, stripping a few leaves from the bottom, and planting it directly into soil. Numerous cultivars have been selected for garden use. Rosemary leaves are used as a flavoring in foods, such as stuffing and roast lamb, pork, chicken, and turkey. Fresh or dried leaves are used in traditional Mediterranean cuisine. They have a bitter, astringent taste and a characteristic aroma which complements many cooked foods. Herbal tea can be made from the leaves. When roasted with meats or vegetables, the leaves impart a mustard-like aroma with an additional fragrance of charred wood that goes well with barbecued foods. In amounts typically used to flavor foods, such as one teaspoon (1 gram), rosemary provides no nutritional value. Rosemary extract has been shown to improve the shelf life and heat stability of omega 3-rich oils which are prone to rancidity. Rosemary oil is used for purposes of fragrant bodily perfumes or to emit an aroma into a room. It is also burnt as incense, and used in shampoos and cleaning products. Rosemary contains a number of phytochemicals, including rosmarinic acid, camphor, caffeic acid, ursolic acid, betulinic acid, carnosic acid, and carnosol. 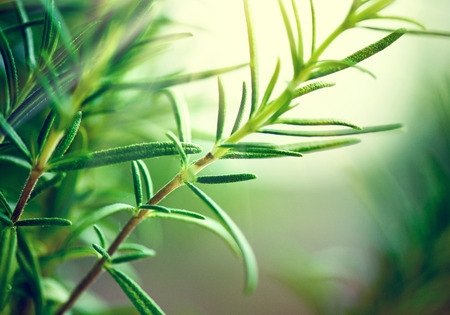 Rosemary essential oil contains 10–20% camphor. The plant or its oil have been used in folk medicine in the belief it may have medicinal effects, although there is no scientific evidence it has such properties. Rosemary was considered sacred to ancient Egyptians, Romans and Greeks. Don Quixote (Part One, Chapter XVII) mixes it in his recipe of the balm, fierabras. The plant has been used as a symbol for remembrance during war commemorations and funerals in Europe and Australia. Mourners would throw it into graves as a symbol of remembrance for the dead. In Shakespeare's Hamlet, Ophelia says, "There's rosemary, that's for remembrance." In Australia, sprigs of rosemary are worn on ANZAC Day and sometimes Remembrance Day to signify remembrance; the herb grows wild on the Gallipoli Peninsula.